BETTER PRODUCTION Shops Using Technology mmsonline.com December 2017 MMS 103 e x p a n d i n g i n i t i a t i v e brings together. 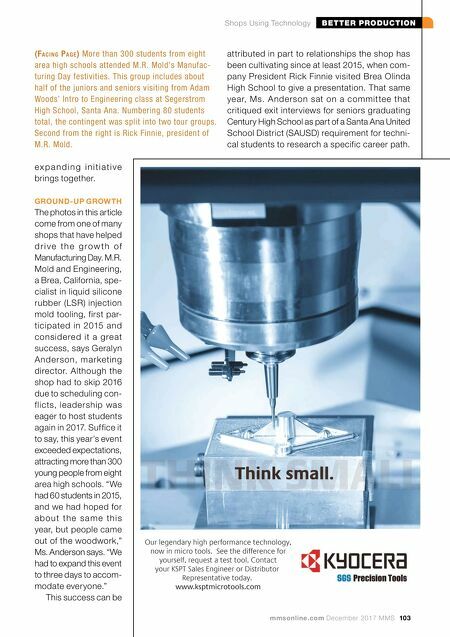 GROUND-UP GROWTH The photos in this article come from one of many shops that have helped d r i v e t h e g r o w t h o f Manufacturing Day. M.R. Mold and Engineering, a Brea, California, spe- cialist in liquid silicone rubber (LSR) injection mold tooling, first par- ticipated in 2015 and considered it a great success, says Geralyn A nderson, marketing director. Although the shop had to skip 2016 due to scheduling con- flicts, leadership was eager to host students again in 2017. Suffice it to say, this year's event exceeded expectations, attracting more than 300 young people from eight area high schools. "We had 60 students in 2015, and we had hoped for a b o u t t h e s a m e t h i s year, but people came out of the woodwork," Ms. Anderson says. "We had to expand this event to three days to accom- modate everyone." This success can be Think small. THINK SMALL THINK SMALL Think small. Our legendary high performance technology, now in micro tools. See the difference for yourself, request a test tool. Contact your KSPT Sales Engineer or Distributor Representative today. www.ksptmicrotools.com attributed in part to relationships the shop has been cultivating since at least 2015, when com- pany President Rick Finnie visited Brea Olinda High School to give a presentation. That same year, Ms. Anderson sat on a commit tee that critiqued exit interviews for seniors graduating Century High School as part of a Santa Ana United School District (SAUSD) requirement for techni- cal students to research a specific career path. (Facing Page) More than 300 students from eight area high schools attended M.R. 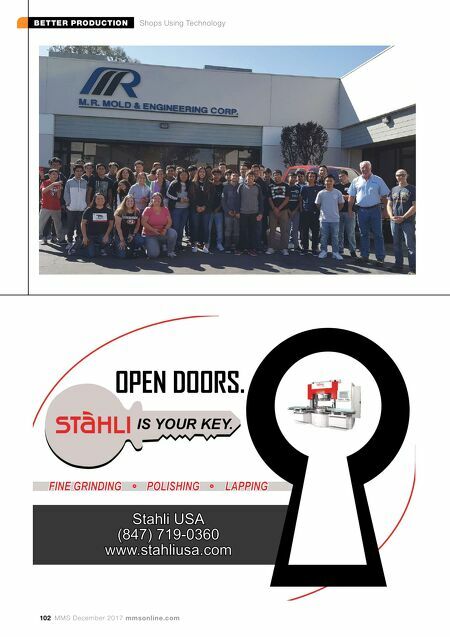 Mold's Manufac- turing Day festivities. This group includes about half of the juniors and seniors visiting from Adam Woods' Intro to Engineering class at Segerstrom High School, Santa Ana. Numbering 80 students total, the contingent was split into two tour groups. Second from the right is Rick Finnie, president of M.R. Mold.